In the words of the late Andy Williams, "It's the most wonderful time of the year," and it's never been easier to add sparkle to embroidery designs than with hot-fix crystals. 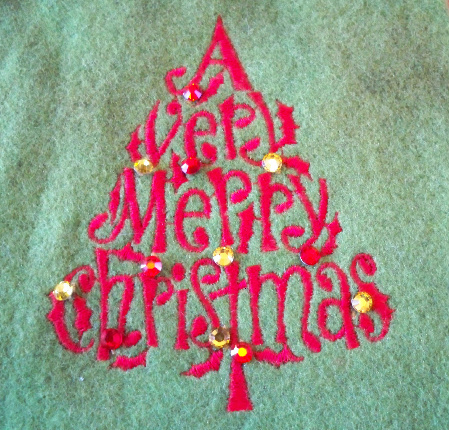 Christmas embroidery begs for embellishment. Crystals are easy to apply with a heat tool like the DalWand. It has seven interchangeable tips to apply hot fix crystals, studs, nailheads, and pearls. It also functions like a mini iron for applique using the included flat iron attachment. Crystals are available in different sizes and colors. 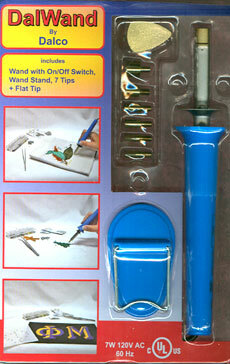 The wand helps position crystals and heat-sets their adhesive backs to the fabric. In addition to wearables and home décor, hot-fix crystals are perfect for decorating Christmas tree, wreath, and snowflake ornaments. Unfortunately, this photo really doesn't do them justice. They are brilliant, taking embroidery to an even more elegant level. You can also use crystals in birthstone colors to personalize ornaments. Use this birthstone chart to help identify colors for each month. Although crystals can be added to any design, some embroidery designs are specifically digitized for use with crystals while others, like lace snowflakes, are equally easy to "crystalize." The Merry & Bright collection I covered in an earlier blog was created to use with battery-operated lights or crystals. 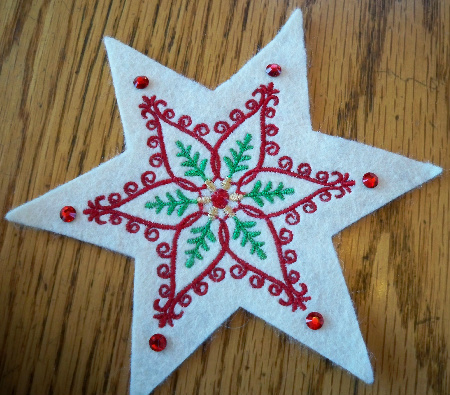 Check back for a tutorial on the completed star ornament above. Debbie - I cannot say enough about the DalWand. I have had one for years and use it constantly. I love a little bling! One thing that you have shown is that just a little is often just right. Too much bling is for costumes and just a little is more for the glitter that just catches your eye. I know that once you place your first crystal, it is hard to stop. But one thing that you can do when this 'more, more' attitude grabs you is to get some things right out of your closet and put some bling on a shirt, jeans or sweater. Another thing is to remember to keep a few crystals in a stash, just like you get an extra button and thread on a nice blouse, you just may need to replace one or two crystals. I hope everyone is checking back to see what ideas are happening in embroidery - it ain't your grandma's embroidery any more! I forgot to mention that the DalWand has an on and off switch. That is important because not all the heating tools have that feature. That switch is a sign of quality.